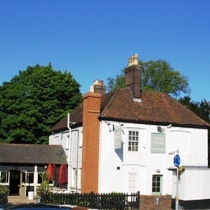 The King Harry in St Albans is much nicer inside than it looks from the outside. It is an old traditional pub with a smart interior and a fairly strange mixture of furniture. It has three or four different areas that can also be used for drinking and/or eating. At the time of the visit two real ales were available; Spitfire and Deuchars IPA. Surprisingly there was more hand pump ciders than real ale with two from Westons and one from Addlestons on offer. As well as around four premium lagers including Hoegarden and Becks they also had Sleemans Honey Brown Lager for sale at £2 a pint. Food was a step up from basic pub food and therefore more expensive. The burger and chips for £8 was very tasty. Atmosphere was good; the pub was fairly busy, friendly and a comfortable place to eat and drink with quiet background music. This place is good in the summer as it has a large garden and patio area at the back.